Hubby and I – for this photography adventure, travelled up to Mount Wombat Lookout, Strathbogie, Victoria – Australia. I wanted to capture the sunrise as it came up and over the mountain range. Mount Wombat Lookout is situated on a mountain plateau which offers 360 degree views of breathtaking landscape – a photographers dream! 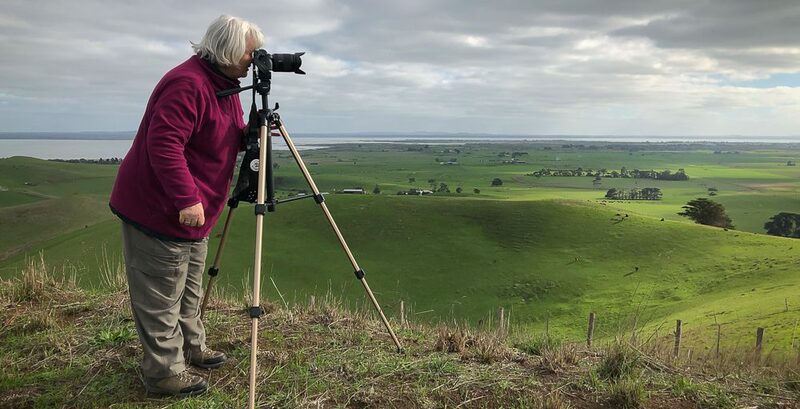 On our way back home, I was also able to capture some beautiful shots which took in the views around the ‘Kevin View’ farming region and of a small lake in Euroa. Early morning is such a beautiful time of the day, and watching it unfold and seeing the light change as the morning processes – just magical! My favourite photograph of the trip is this particular one featured here below. Taken from the very top of Mount Wombat, looking out above natural Australian bush, towards the mountain ranges and directly into the sun – made for a magical photograph. The photograph featured here below didn’t work well in colour, so I decided to see if it worked better as a black and white photograph. I was pleased with the results, especially after using Adobe Lightroom Classic CC’s ‘dehaze’ tool within the ‘Develop’ module. It gave the image a soft magical look which I like. The towers, wire fencing, the shed and tubing on the ground where my hubby is standing, gives the image an industrial feel. Interesting, when taking into account, it is situated at the very top of Mount Wombat which has 360 degree landscape views of the Strathbogie region. This entry was posted in Photography and tagged Adobe Lightroom Classic CC, Apple iPhone 8 Plus Photography, Australian Bush, Black and White Photography, Blue Skies, Karen Robinson Photography, Kevin Views, Landscape Photography, Mount Wombat, Sense of Wellbeing, Sony A FE24-240mm F3.5-6.3 oss Lens, Sony A7 Mark II Camera, Strathbogie, Sunrise Photography by idoartkarenrobinson. Bookmark the permalink. It’s refreshing to see some wonderful different shots of the world. Many thanx for sharing.